Previously I looked at the financial aspects of the proposed cuts to the Medicare Rebate. This article assumes knowledge of the previous article. There are non-financial impacts we seriously need to consider. In this article I look at Continuing Professional Development (a doctor impact) and treatment delay (a patient and community impact). Policies, based only on financial considerations, that discourage people from seeking treatment at the earliest (and therefore cheapest) opportunity are knee-jerk reactions at a momentary point in time with no thought for the future or the non-financial impact of those policies. Research shows such short-term “savings” actually result in higher costs and sicker people in the long-term. Doctors hold our health in the palm of their hands. Yes, we, the patients, certainly have a major part to play in caring for our own health, but the reality is the doctors decide what tests to run, what medications to prescribe and whether we need to see a specialist or a surgeon. In order for doctors to care for us in the best way possible, they can’t be consulting all the time. We expect the medical profession to keep up-to-date with advances in the field. Again I will use my own case as an example. The RF (Rheumatoid Factor) test had been the stock standard test for Rheumatoid Arthritis (RA) for many years, well over half a century. Unfortunately, specificity is not very good: IgM RF, the isotype most typically detected, is seen not only in RA but also in various other conditions. Also, some RA patients never test RF positive. There is a new (relatively speaking in research to commercially available terms) blood test, the anti-CCP with much higher specificity and in many cases earlier detection of RA. Earlier detection leads to earlier treatment resulting in better outcomes. As a patient, you expect your doctor to know about new tests. Continuing Professional Development (CPD) takes time (up to 50 hours a year is specified in some cases) and effort and can be costly. Certainly my general practitioner may be able to learn about a new blood test from a medical journal or a medical association newsletter, but these cost. Journal subscriptions and association memberships don’t come free. There is the time required to read the information, absorb it, understand it. This is all non-revenue generating time. What of our surgeons? New surgical techniques are constantly being developed. We can have laparoscopic hysterectomies these days, a far cry from the full abdominal cut. We want our surgeons to know the least invasive techniques, don’t we? Learning these may be a bit more time-consuming and/or expensive than reading a journal article about a new blood test. Remember the days of “exploratory surgery”? My mother had some of that. Now with modern imaging techniques, one rarely hears the term. Yet without knowledge of these advances, our doctors would still be recommending exploratory surgery. Doctors are no different to the rest of us. They have families, mortgages and household bills. They like to go to their children’s sports events and school concerts. Date nights with their spouse are important, just as for all of us. Doctors are normal people with normal lives. They are entitled to time off. Yes, there are some doctors who are very rich. So are some plumbers and electricians. Most are not. Many have the added responsibility of running a business: it isn’t just the medical knowledge. If we arbitrarily cut the gross revenue of our doctors, yet the running costs of their businesses and their family lives continue to increase in line with the overall economy, what might suffer? I suggest it might be the extra CPD most doctors do to stay abreast and that impacts on all of us. Or the study diligence will suffer, perhaps, without them even realising. My profession also requires CPD but I can tell you right now if the kids need help with homework, or the dinner needs cooking or the pantry needs restocking, my professional journal can sit untouched. They’ll do the legal requirement, of course, but is that enough to be the best when medical advances are frequent and across the breadth of medical knowledge. Will they be forced to attend cheaper courses or conferences for a lesser value learning experience? NB: There is no intention to imply doctors would deliberately compromise their CPD. Apart from CPD, cost pressures may force staff reductions in a practice. One nurse instead of two, or one less receptionist. How will this impact on you? Will medical practices close and the doctors change professions? If the doctors do, as they have said they will have no option but to do, pass the cost of the lost revenue on to the patients, then we have the potential for the second consideration. I think we all know these days that the earlier a medical condition is detected and treatment begun the better the prognosis for the patient. Breast cancer, colon cancer, rheumatoid arthritis – the list goes on. In every case you will find the words “early detection”. When the costs of a medical consultation or tests or prescriptions become a barrier to seeking medical advice, the condition worsens. Once the patient is forced through deteriorating health to finally seek treatment they may be unable to continue to work, they may die much earlier, they may need much longer and more expensive treatment. All of this is an unnecessary financial burden to the health system and consequently to the community. Not to mention the cost to children who lose parents too early or the spouse who loses a partner. The following is about the USA experience. Is this really what we want for Australia? Here is a similar study involving children in the Philippines. It is often said that maternal mortality is overwhelmingly due to a number of interrelated delays which ultimately prevent a pregnant women accessing the health care she needs. 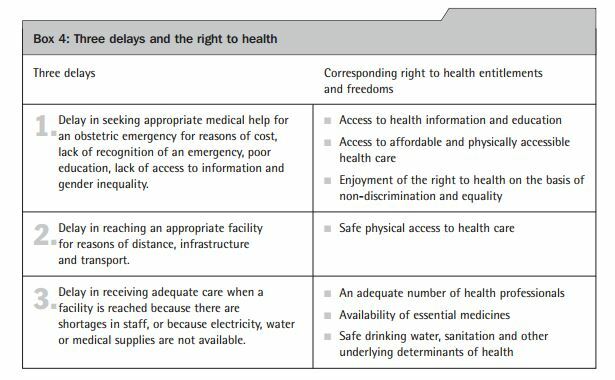 Each delay is closely related to services, goods, facilities and conditions which are important elements of the right to health (see Box 4). Is this what we want for Australia? The word cost is up there in the top left-hand square. What other non-financial impacts can you contribute to the discussion? I am sure there are many, many more. Have you, or anyone you know, already ever delayed seeing a doctor due to the cost or fear of the cost of any treatment? Please share your experience. Sign the RACGP Petition HERE! You’re doing some great work here Robyn. Hope the general public realize that it is imperative that Doctors need time to keep up to date. We must fight to keep Medicare as it is at present. Thank you Sandra. I believe we have to enhance, not destroy, our health system. I am a firm believer in universal health care! No objection to private health insurance, but we MUST have universal health care.